You ought to be consistently checking the pH levels and total alkalinity levels in your warm water hot tub or spa. The pH and alkalinity levels play an important role in keeping spa water in perfect shape: clear, cloudless, soft, steady and forgiving instead of harsh. If your pH is too high, you’ll notice poor sanitization, clouded water, scale formations, short filter lives, eye irritation and more. If you’ve tested and noticed low pH, low total alkalinity, or you’re experiencing any of these symptoms in your spa water, consider Spa Down by Leisure Time. 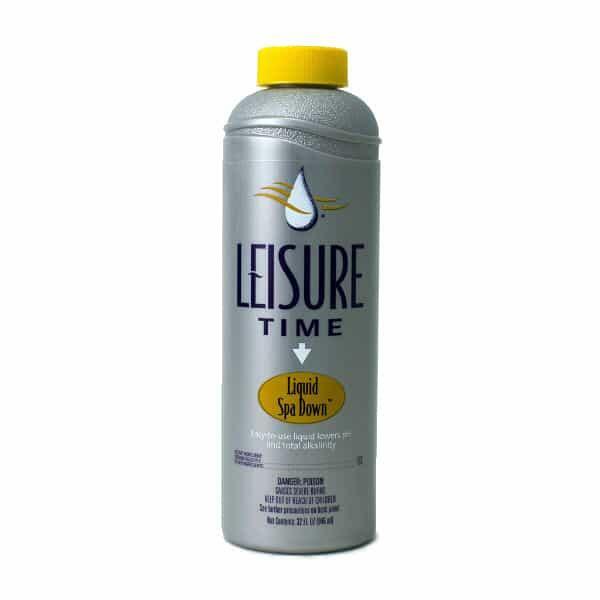 Leisure Time lowers pH and total alkalinity to bring hot tub water back into perfect balance. Spa Down comes in a dissolving format, but this liquid format is the latest and greatest from Leisure Time. The Liquid Spa Down formula is pre-mixed and measured for easy use and quick application. Enjoy the ease in which you deliver fast results to your home hot tub!